In 2016, the Chartered Institute of Building Services Engineers (CIBSE) released new weather data sets to be used in the UK construction and building services industry. Weather files are used by Building Services engineers to predict thermal comfort in buildings, at the design stage, and thereby to assess compliance with the relevant thermal comfort regulations. 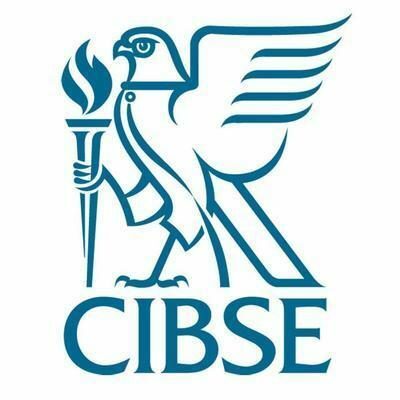 Historically, CIBSE provided two types of weather file for 14 different locations across the UK: the Test Reference Year (TRY) and the Design Summer Year (DSY). In this latest update to the available weather data, changes have been made to both types of weather file, with more significant changes being made to the DSY files. The TRY weather file is intended to represent a ‘typical’ weather year, designed to be used for making estimates of predicted energy consumption. The TRY is, therefore, an assembled composite of average months from a database of historical weather data. Previously these months were selected from a 21 year period (1984-2004). In the 2016 update, this timeframe has been extended to cover a 30 year period (1984-2013). This is to ensure that any observed effects of climate change are included in the weather file. The table below shows the months used in the previous TRY weather files and the months selected for the new TRY weather files. The original DSY weather files were designed to represent a year with a hot, but not extreme summer. The year selected was that with the third hottest average temperature between April and September. As with the TRY weather file, the year was selected from a 21 year period (1984-2004). 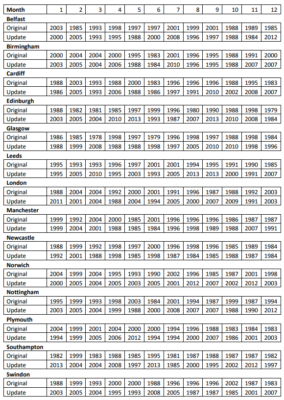 For the newly updated 2016 DSY weather files, the period of time from which the year is selected from has been extended to 30 years (1984-2013). Following the recommendations made in CIBSE TM49: Design Summer Years for London, the method of selection has also been updated. – DSY1 – A moderately warm summer. Summers will have a 1-in-7 chance of being equal or hotter than this DSY. – DSY2 – A summer with a short intense warm spell. An intense summer with a heat event the same length of that of DSY1, but with a higher intensity. – DSY3 – A summer with a long less intense warm spell. The heat event is less intense than that of DSY2, but has a higher intensity than DSY1. It has a longer duration than that of DSY1. In addition to there being 3 types of DSY weather file based on historical data, CIBSE has also produced a set of DSY weather files based on predictions of future climate for the years 2020, 2050 and 2080. Within these future weather files there are options for high emission predictions (2020, 2050 and 2080), medium emission predictions (2050 and 2080), and low emission predictions (2080 only). This future weather data is intended to help designers account for changes in global climate. In general modelling of buildings, the DSY1 2020 weather files will be used. An impact of these new weather files on Breathing Buildings is the upcoming revision of BB101 will use the 2020 DSY1 weather file. The DSY2, DSY3, 2050 and 2080 weather files will be used for ‘future proofing’ designs. 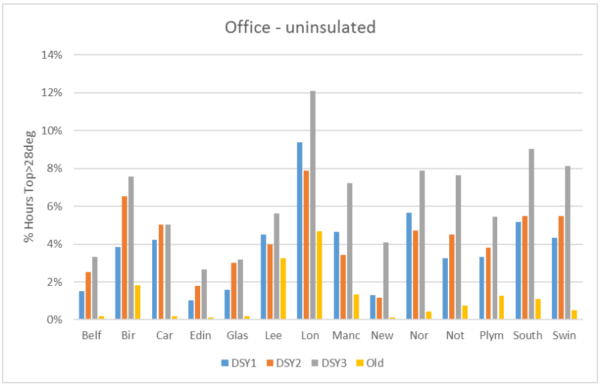 The graph below shows how overheating in a typical uninsulated office compares when modelled using the original (“old”) DSY weather files and updated DSY weather files. The harshness of the summers in the updated weather files can be seen in this data; the predicted overheating for all locations is more severe with the updated weather files compared to with the original weather files. In the case of modelling buildings in the London area, the most appropriate file for the project should be selected. Both TRY and DSY weather files have been updated to include 30 years’ worth of data (1984-2013) compared to 21 years of data (1984-2004) in the old weather files. This update has been made to help account for changes in the climate. The DSY files have been further updated with a new methodology for selecting the file. This new method has been updated based on TM49: Design Summer Years for London. The DSY files have also been updated so that there are 3 types of file, DSY1, DSY2 and DSY3, which vary in severity and length of summer event. These weather files come in multiple versions, current and future (2020, 2050 and 2080). The more severe and future weather files can be used for ‘future proofing’ buildings. Breathing Buildings will use the 2020 DSY1 weather files for the upcoming new BB101. There has also been an update for the London weather files, meaning there are now 3 different regional weather files for London, instead of one. This is to account for the variation in temperature throughout the London area.